This post comes from having an underutilized vertical monitor. The two things I make use of the most in this post conveniently happen to look great vertically. Do not adjust your monitor. You’ve probably had a little play on using Twitter as a method of first contact before, but you may not have used it as a way to source potential placements. Twitter is excellent for both of these. 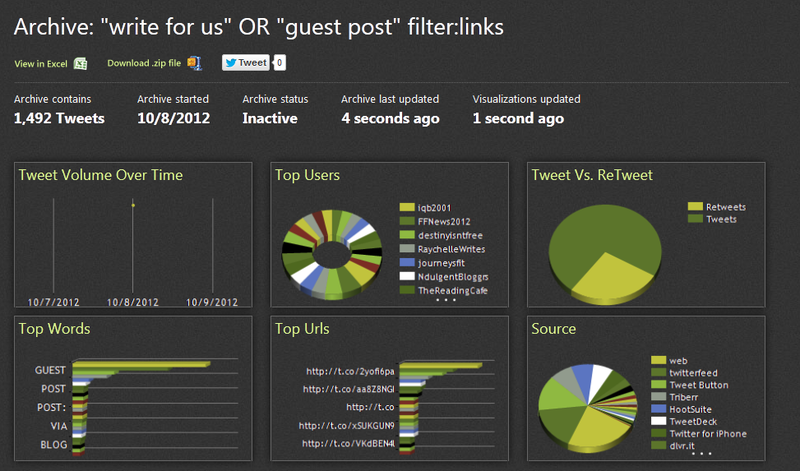 So who’s most likely going to be wanting guest posts? A good place to start would be the people asking for guest posts and the sites already publishing them. Websites usually tweet every post they make and often differentiate whether the post was written by one of their team or an outsider. They do this either in the tweet or in the URL structure. To improve your data I’d tag filter:links onto the end of your query if you’re looking for tweets with links to posts, but not if you’re looking for “would anyone like to write a post for us?” type tweets. After a little bit of a play around you should have a few dashboards set up. You could just monitor these and get to work, but I’d like to do better. For now our query will be the uninspired: “travel” “guest post” filter:links. This tweet appeared for the search: “travel” “guest post” filter:links . 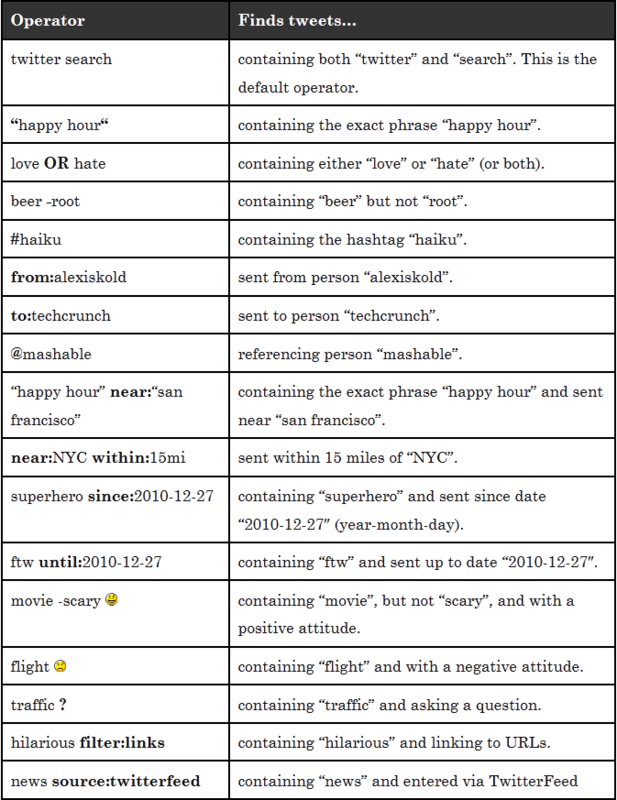 The search terms appear in the expanded URL (http://ephemerratic.com/travel-bucket-list-guest-post-jetpac). So far so good. We have a live, constantly updating list of relevant websites and authors that are publishing content. So am I expecting you to sit on twitter visiting these URL’s one at a time? No. It’s not that bad of an idea though, but we can do better. Enter Tweet Archivist. This service doesn’t archive every single tweet, but it seems to quickly (we’re talking a couple of seconds) archive the most recent 1500 or so tweets for a search term and allows you to download this ready to use straight into excel. Saves you scraping it. It also does some pretty cool visualisations. Go get the archives for the searches you care about. If they’re broad enough (given the number of tweets per day, they probably are), you’re going to be able to rinse/repeat this action daily. But there’s a problem: Twitter and it’s pesky users shorten URL’s, making any data gathering useless – not to mention Tweet Archivist only gives you the full tweets and not the links within. Fortunately, you can 1) get the links out, and 2) unshorten the URLs in bulk. Select all, copy and paste into your favourite text-to-links tool. Mine is still outreachr’s. You now have a hyperlinked list of places that accept and promote guest posts. If you can’t be bothered with the rest of this post, that’s fine. Go check out the 1000 or so guest post opportunities you’ve found. If you’re still with me, fire up SEOtools for Excel. Paste the URLs from Outreachr into another column in your table. The data can get messy here. For the unshort.me API, you’d be looking for “resolvedURL”. I’m testing others at the moment. If you’re going to use either of these methods my advice would be to start small on a batch of 10 or so in a new tab and escalate until you’re confident you won’t break it. Once you eventually have your results you can use whatever method you like to gather your bottom line metrics and filter accordingly. You can get very creative here, remembering you already have things like their Twitter handles. Let me know how I can improve this! That twitter search function thing is ACE – I had never really known how the twitter search works before, but this is an awesome resource! Congratulations on being the first non-spam comment on here. This earns you a followed link. When I’m off this train. Very nice idea. Not seen Tweet Archivist used link that before. The advanced Twitter search functions are awesome…. printable and reference-able! And yup – I (like many here, it seems) am also an Archivist fan! Hilarious to find my tweet in your post! This is an amazing post I agree with your views badly.